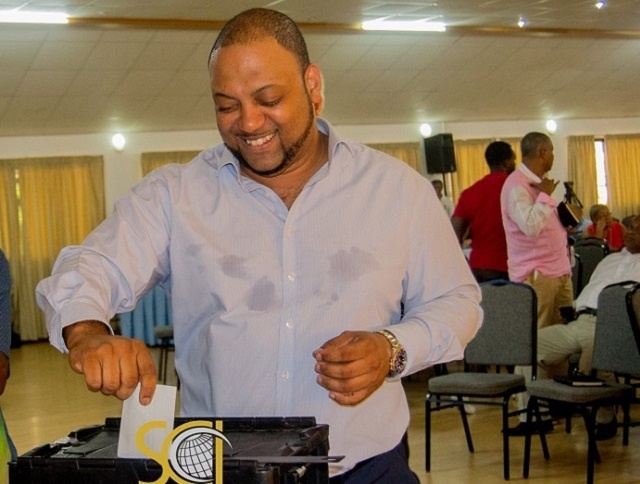 (Seychelles News Agency) - The newly elected chairperson of the Seychelles Chamber of Commerce and Industry (SCCI), Oliver Bastienne, wants to have a collaborative and united approach for the organisation. Bastienne, 36, was the acting chairperson and was elected at the SCCI’s annual general meeting held on March 28, 2018, as prescribed by the organisation’s constitution. SNA met with Bastienne to learn more about his vision for the chamber. SNA: Hello and thanks for meeting with SNA. Tell us about your background. OB: I am an accountant by profession. I followed my studies in the UK, Loughborough University. It was a four-year degree and once I finished that I went to work for a company called Ernst and Young. I've spent nine years in Singapore and 10 years in the UK. I came back to Seychelles about six to seven years ago. I've got a lovely family - two sons. I've got a lovely team that works here at the secretariat and another lovely team that works for me in the company that I share as a partner. In general, I am a very simple person - I live by the principle of integrity, ethics, and honesty which to me is very important. SNA: When did you join SCCI and for what reason? OB: I joined SCCI two years ago and I was very inquisitive - I wanted to understand what SCCI was all about. Over the years I have seen what SCCI is not doing and what it can do. I believe that the chamber is a very important organisation for all enterprises in the country. I don’t believe that there should be segregations, that the youth, artists, small little contractors, and people on La Digue and Praslin cannot join the chamber. It is an all-inclusive chamber. I appreciate the views that have been received from some of the members. I want to make it very clear that under my leadership the chamber of commerce is an inclusive chamber for all enterprises. SNA: You were the acting chairperson, then the chairperson resigned. Was there any limitation? OB: I believe that the way I became the acting chairperson was constitutionally right and I wouldn't be serving justice to my constitution if I say that there was any limitation. I believe that the main limitation the chamber has had is credibility. This is why going forward, we've reconstructed the vision and the strategy of what the chamber should be about and this has taken some time. As a team, we have formulated what we feel is the best way forward and we are seeing the response by the business community. We believe that we are creating a solid foundation, in the way that the chamber of commerce should really work. It is a still a long way to go but we need to start somewhere. SNA: You won the election not long ago. How was the competition and were you expecting to win? OB: Firstly there was no competition until the day of the AGM itself. On the annual general notice, we had mentioned that the nomination for the chairman should have been presented 14 days before the AGM. No one did and in actual fact, there were two motions in the AGM seeking for the nominations to be on the day itself. As any candidate who wants to become the chairperson of the SCCI, I believe it is very important to stand up, represent and communicate where you see the chamber going and towards which vision. Some traditional members felt that it was a political campaign. I was completely flabbergasted because what is wrong with a young Seychellois standing up and saying that this is what he believes in. I found it disappointing that after such an important period of time where we have worked so hard to implement things. We have launched a new website, created a wonderful business award boom and set up a new office. We have gone to La Digue and Praslin, done training and breakfast meetings, all positive in terms of initiatives. No one even talks about that. I would like to say to all those who do understand where the chamber wants to go, come and meet me, sit down and discuss. It is a very important role. SNA: Is there anything new that you would like to bring into the chamber to promote businesses in Seychelles? OB: We need to explore the strategies and then better comprehend the scale of what we want to do. We talk about governance and transparency. That is more or less looking at things internally first. Governance is about implementing solid structures and processes. We need to look at our executive council. We now have representation from the Bankers Association, SHTA, the farmers' industry, the entrepreneurship and education, artist from the service industry. It is not perfect but it is a start and we are moving in the right direction. We have solid links with Praslin and La Digue, ensuring that we include everyone. For the transparency we have set up a lot of new little committees and one of them is centred on the reform committee and a component of that is around the constitution. We do not receive any subvention from the government so it is very important to have a committee that raises money through various initiatives. We want to create a very powerful database for our members to understand who their supplies are and so forth. This will help when we hold discussions with the government when it comes to policymaking. On collaboration and unity, we will keep on having meeting and having a good monitoring mechanism that will ensure we are following up on issues. We are setting up three working groups centred on large SME and micro start-ups and artisans. We would like to have more collaboration with the private sector. We are trying to encourage associations to come in and be part of the chamber. We can constantly work with the national assembly to keep them appraised of what is going on in the private sector. We can cross-share knowledge. With the judiciary, we are trying to set up an arbitration centre and we are very happy that we will be working alongside the Attorney General Mr Frank Ally. SNA: What do you think should be done to facilitate the ease of doing business in Seychelles, especially for the locals? OB: We encourage the government to not only look at it from the perspective of the ease of doing business ranking report. It is good to rank things but people might still feel that is impossible to do business in Seychelles. We need to appreciate and understand that the business landscape at times can be construed as challenging, especially when looking at processes and procedure. A lot of the time you hear the complaints and see the issues but it is important to be factual at the same time. The government has to be subcritical as well to acknowledge that they have an issue. If the private sector is going to be the engine of growth, then we need to be facilitated. You cannot have bottlenecks, double or triple layers of bureaucracies that doesn't make sense making it inefficient to business and it becomes very expensive to do business. SNA: You have touched a little upon the visit that you paid to the president. Was there anything else that was discussed during that courtesy call? OB: We spoke about the strategy, the need for there to be honest discussions between the government and SCCI. We also touched upon the need to empower the enterprise and appreciate the risk that they undertake when we do undertake a venture. More importantly, it was the discussion around the future and how we are going to work together. There is a need for the private sector to take leadership to attain development. SNA: How do you find the balance between having a business and running SCCI? OB: Very hard. Being the chairman of the chamber has always been an unpaid position and has always been filled up by someone in the industry, and also someone who believes can give his time for the development of the chamber. You have to be proactive and determined to do this. There is a need for constant training, promotion of businesses, to have an established website, to have meetings. 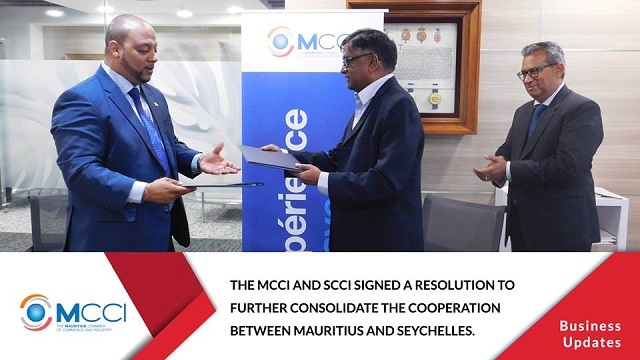 What I would like to see is a chamber where members are effectively utilizing it, where dignitaries can come and see the culture of Seychelles. 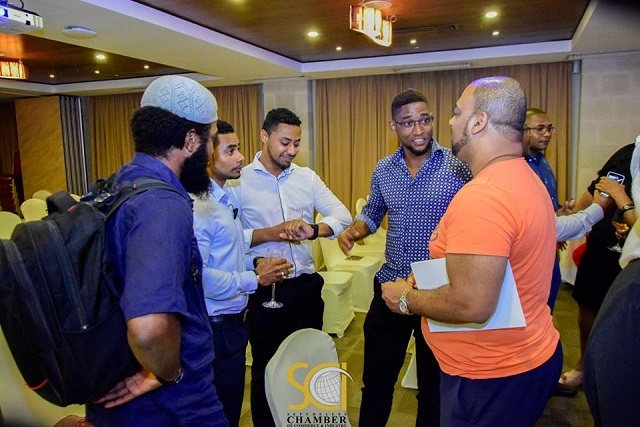 SNA: What is the chamber’s plans to encourage local businesses to join SCCI? OB: It is our responsibility to create a unique selling point, to show what we can do and what we are doing. I do believe that action speaks louder than words. It is about creating the USP, living and breathing what you may. You practice what you preach. It is very simple.